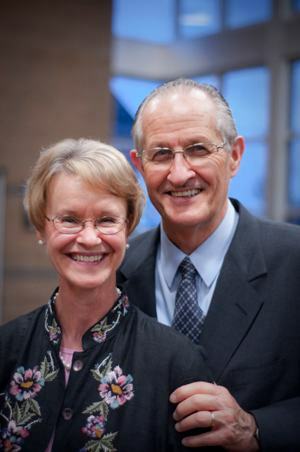 Doug & Margaret Nichols are graduates of Prairie Bible Institute – Doug in 1966 and Margaret in 1967. During summers while attending Prairie Bible Institute, Doug worked with Northwest Independent Church Extension (NICE) and various Bible camps, especially Island Lake Bible Camp in Poulsbo, Washington, where Doug and Margaret officially met. The same summers, Margaret traveled with various music groups of Prairie throughout the US and Canada. Doug served with Operation Mobilization in India for two years from 1966-68. After Doug returned from India, Margaret and Doug were married on December 27, 1968. In 1970 they went to the Philippines after being accepted by Overseas Missionary Fellowship (OMF) and after spending three months in Singapore for orientation. In 1972, Doug and Margaret were loaned by OMF to serve with Christ for Greater Manila (CGM), a Filipino organization established in 1963 by OMF missionaries and Filipino leaders. The main emphasis of CGM was evangelism, compassionate care, and development among the millions of Metro Manila. Doug served as Director from 1972 to 1992. As CGM grew, Doug established Action International Ministries (ACTION) to handle the sponsorship of missionaries and became its International Director in 1974. In 1974, Doug was asked to represent the Philippines at the first Lausanne World Congress on Evangelism in Lausanne, Switzerland. He attended with one other missionary and 65 Filipino pastors and leaders. He later also represented the Philippines at the Amsterdam Congress on Evangelism with 90 other Filipinos. Over the years CGM grew to 160 Filipino workers, with 70 ACTION missionaries with outreaches in evangelism and discipleship throughout Manila and the Philippines. ACTION grew to 260 missionaries, expanding to Latin America, Europe, and finally Africa. Doug stepped aside as International Director in 2009 but continued to serve as International Coordinator of Pastoral Leadership Development and Children in Crisis, mainly focusing on the Philippines. In 2013, Doug and Margaret retired from ACTION to serve in an expanded ministry with Commission To Every Nation (CTEN) as Global Mission Mobilizers/Advocates. With CTEN they mainly focus on the Philippines and untrained pastors worldwide (3.2 million), street and underprivileged children (100 million), and the Filipino International Network (FIN). During their senior years, Doug (75) and Margaret (72) continue to assist and partner with CGM (now renamed Christian Growth Ministries), GROW International Ministries, and other Filipino organizations and churches throughout the country. Assistance to needy pastors with used laptops, hearing aids, glasses, ministry supplies, etc.